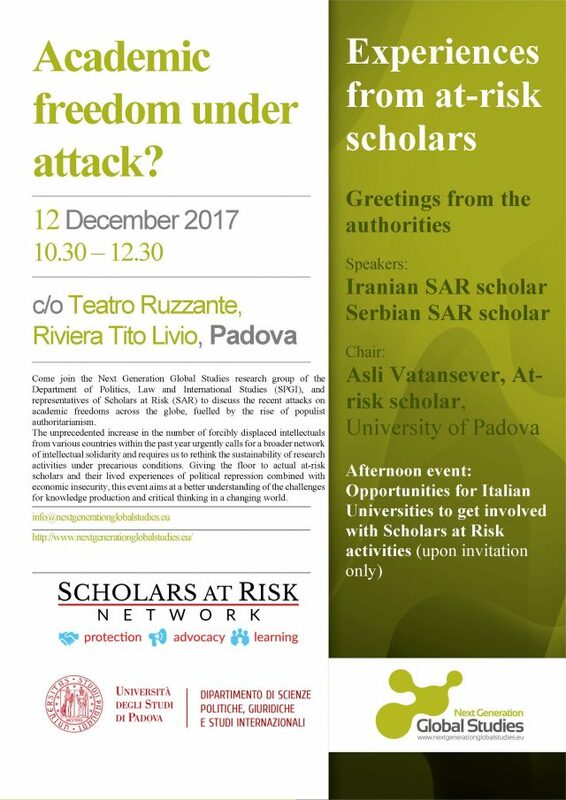 Representatives from the Next Generation Global Studies research group of the Department of Politics, Law and International Studies of the University of Padova, Italy and representatives of Scholars at Risk will discuss the recent attacks on academic freedom across the globe. The unprecedented increase in the number of forcibly displaced intellectuals from various countries within the past year urgently calls for a broader network of intellectual solidarity and requires a rethinking of the sustainability of research activities under precarious conditions. Giving the floor to actual at-risk scholars and their lived experiences of political repression combined with economic insecurity, this event aims to better understand the challenges for knowledge production and critical thinking in a changing world.